In Viet Nam, the first mortal aggressors from the West flew the Stars and Stripes. The most famous ship in the history of the U.S. Navy, 'Old Ironsides herself, bombarded the Empire's chief port and sailed off, leaving a few Vietnamese dead. Innocent victims of a quarrel they knew nothing about, this modest mass murder did alter the whole pattern of relations between Viet Nam and the West. The villain here was a penitent and senile ruffian, so much the man of his time he was held up long after as the gruff, but lovable model of a Yankee sea captain. Disavowal of his assault by the United States government was not followed by the kind of punishment which the American public would have demanded if some foreign vessel had fatally bombarded Boston and seized a few of its magistrates as hostages." - Excerpt from an unpublished manuscript "Vietnam: Neglected Antecedents" by Ira Bodry. The port referred to above is now called Da Nang. Ira Bodry's life and his death about 1970 remain a mystery. Surfacing in the late 1960's as a self-proclaimed and self-taught researcher he dedicated himself to unearthing the antecedents to the U.S. war against Vietnam. For some time, he gave his findings to various well known writers on the war and then just before his death he gave several public presentations and announced he was going to continue his research in France. However, he never made it. He was reportedly gunned down by the D.C. police outside a travel agency. It seems he had many secrets of his own. One was his boost to those he trusted that he would never let himself be returned to prison - where he'd spent some time as a youth. His self-education and dedication to the anti-imperialist cause seemed a kind of individual guerrilla warfare against the state he'd learned to hate. Besides his considerable contributions to the scholarly works of others, he had prepared a draft of his own, the "Vietnam: Neglected Antecedents" published below. Whatever his literary or historical merit and skills, the attached documents alone expose the horrific mind set of early American imperialists. How Ira was able to do all this was another of his secrets. He carried a pistol and claimed he supported his research by robbing one bank a year. Not violent nor greedy, a few thousand was enough to sustain a year of research. He had a small apartment crammed full of documents and years of notes, but all this disappeared the day he died in front of that travel agency he never got to use. Or at least, that is how I remember it after all these years. The one thing I am very sure of is that Ira, or Van Lee as he sometimes called himself, hated the war and all the arrogance that led up to it. Honoring that spirit and many others who gave their lives against war and imperialism, I am making his writings and the documents he uncovered available to all. Since his old pages won't scan to text, I'll start with the documents and enter the manuscript as my fingers hold out. Along the way, I would welcome any information that anyone has on Ira or his work. [As of 2013, I have heard nothing. It makes me sad to think this guy literally gave his life to produce useful research for many anti-war writers of that era and ended up dead from a DC police bullet. Walter Teague 9/27/99 Updated 02/17/2018. Documents referenced in Vietnam: Neglected Antecedents. 1. Vietnam: Neglected Antecedents By Ira Body Written up to about 1970. Includes: Background and brief biography of Ira Bodry, Introduction, Chapters 1 through 5 and 3 letters listed below. Typed manuscript. PDF and HTML versions. 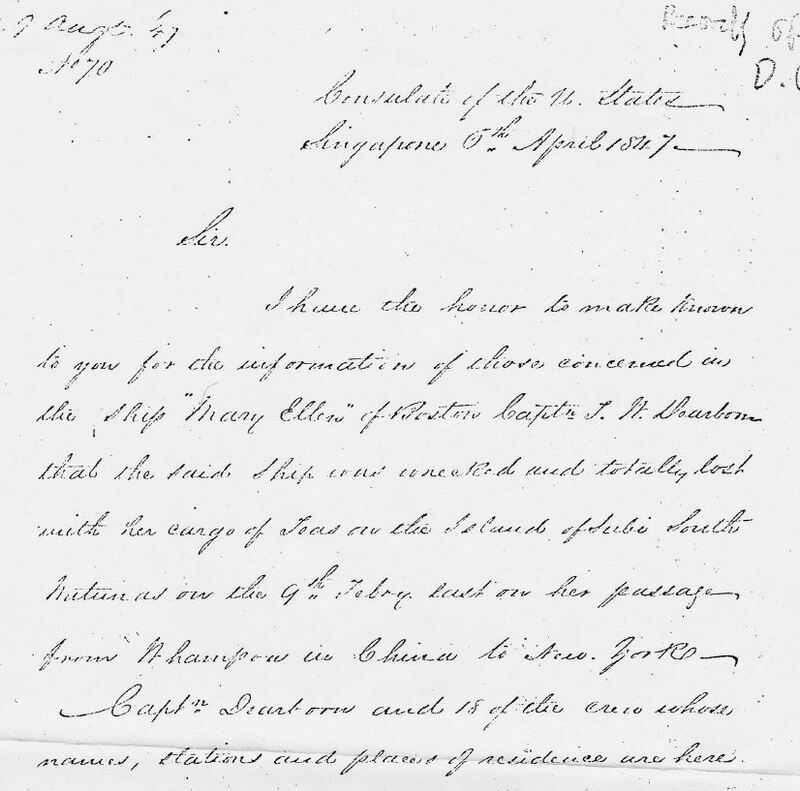 Consul reports Mandarins' description of the 1845 attacks by the USS Constitution. Warns it leaves an unfavorable impression. H070 Records of D.O.S. Consular Letters Records Dip Branch. 3. Letter of Credentials From Zachary Taylor President to the King of Anam Undated, but about 1949.. For Mr. John Balestier, US Counsel, Singapore Photocopy. Photocopy and full text. 4. 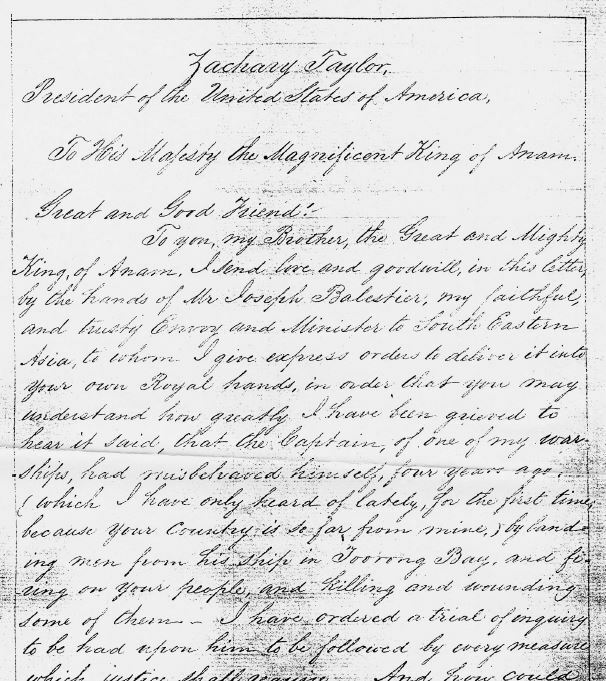 Letter from Zachary Taylor From President Zachary Taylor to King of Anam Aug. 16, 1849 President Taylor denies US responsibility for Percival's alleged acts and then threatens to militarily attack Vietnam. Items referenced, but copies and full text not included yet. Midshipman Meriwether Patterson Jones 10 May: Off Touron, Cochin China. 8. Midshipman Colevile Tennett (sp) Oct. 21, 1844 to Sept. 20, 1845 Maybe May 15-24 also. Reports firing on shore at local people who tried protecting their ships. The neglected history leading up to the US war on Vietnam. 2013. Text version in complete. The PDF is complete, but illegible sections are being typed and added. Credentials Letter on Balestier from President Zachary Taylor. Have in full. Journals From the mate and others on the US Constitution . Letter from Consul Balestier He reports on Mad Jack's attack on Vietnam in 1845. Have in full. List of the Neglected antecedents documents This is the primary reference list for Neglected Antecedents and appended. Zachary Taylor threatens the King of Anam President Taylor's "apology" to the King denies responsibility and threatens to attack Vietnam if normal trade doesn't continue. Have in full. Walter's Vietnam Events and Documents.